Whenever we find ourselves far from Turkey’s shores for any extended period of time, nostalgic hunger pangs soon set in. Sure, we quickly develop a hankering for a juicy Adana kebab or even for the simple taste of a simit washed down with some strong tea. But what we really long for is the kind of honest, down-home food found in some of our favorite Istanbul esnaf restaurants (workers’ canteens), humble places where we’ve always found the level of cooking to be top-notch, the service impeccable and the price just right. Unlike, kebab and döner, though, which have succeeded in planting the flag of Turkish food around the world, the concept of the esnaf lokantası has, sadly, yet to really be exported out of Turkey. We were more than delighted, then, to have been told during a recent trip to New York about the existence of Bi Lokma, a restaurant in Midtown that was trying to bring the esnaf experience to the Big Apple. Our previous experience with Manhattan’s Turkish food scene was that it went either high – white-tablecloth kind of places that served upscale versions of classic Ottoman dishes – or low – döner spots that might serve some lentil soup on the side. But there were hardly any places that hit that sweet middle spot the way a good esnaf lokantası does. Could Bi Lokma the place that fills that void? We decided to go find out. Excitedly, we emerged from Grand Central Station and started walking towards the restaurant’s E. 45th Street location. On the way, we marveled at the newfound culinary riches in a neighborhood whose lunchtime offerings were once limited to dreary deli salad bars and pizza by the slice. Within a block of Bi Lokma we passed a Chinese dumpling takeout spot with a line out the door, a sleek place specializing in schnitzel sandwiches (“make it a schnitzelicious day,” a sign outside said, and we almost did) and what looked like an extremely inviting Dominican restaurant. But our hearts started racing as soon as we found Bi Lokma and stepped into the small restaurant. There, at the end of the dining room was a steam table which, in true esnaf style, held a number of stews and other hot dishes which, also in true esnaf style, were being plated by a rather serious-looking chef. Feeling right at home, we waltzed straight up to the counter and, as is the custom back in Istanbul when several of the day’s offerings at an esnaf spot look good, asked for a little bit of this and a little bit of that rather than one main. We quickly realized things were different here when the young maitre d’ (in Turkey, a waiter his age would likely still be learning the ropes and serving tea rather than running the show) told us there would be no mixing and matching. So we couldn’t get the imam bayıldı (eggplant stuffed with onions and tomatoes and stewed in olive oil) with a small side of the roast lamb pilaf? No, he said firmly, the eggplant can only be had with a side of rice or bulgur pilaf. Can we get a small order of lamb pilaf, then, along with the rest of our order? The young man thought about it and then finally said, “Okay, but only today.” Our order settled, we turned around and found a table to sit at and wait for our food to be brought to us, as is the custom back in Turkey. As soon as we sat down, though, we found our host staring at us. “Self service,” he barked. Our hearts sagged. Serving good food is important, but the esnaf dining experience is really about more than just the food. An esnaf lokanta is really a place where a pauper can eat like a pasha – where, in the middle of a workday filled with endless requests being made of him, the average Mehmet can come in and start giving some orders of his own and be treated like a VIP by a crew of seasoned waiters who remain solicitous throughout. It’s affordable luxury, designed to be experienced on a daily basis. Isn’t that just what every Midtown office worker needs? But enough of our – as the locals here say – kvetching. What about the food? Fortunately, in that department, Bi Lokma acquitted itself nicely. The imam bayıldı might have not been swoon-worthy, but it was nicely prepared and momentarily transported us back to Beyoğlu, while the fought-over roast lamb pilaf was just as it should be, an amalgam of sweetness and spice, shot through with currants, pine nuts and a very pleasant lamb flavor that we only then realized how much we had been missing. Bi Lokma also earned points for serving up zeytinyağlı artichokes and celery root (stewed in olive oil and served at room temperature) and, for dessert, sütlaç (rice pudding), dishes that are true esnaf staples and which were a welcome sight to behold in the middle of Manhattan. As we finished our food, another young waiter appeared at our table and set down a good-looking glass of tea in front of us. We glanced over at the maitre d’ suspiciously. Was this a peace offering or just a big city ploy to get a few extra bucks out of us? “On the house,” the young man assured us with a smile. We sipped our comped tea, just as we would have at an esnaf lokantası back in Istanbul. There is hope, we thought, even on the mean streets of New York. Admin, do you have a preferred Turkish spot in NYC? I’ve been a happy patron of Beyoglu (Yorkville, Upper East), well-executed meze and fair prices–especially for New York, but I’m curious to expand my repetoire with something new. Taci’s Beyti, a family-run spot in Brooklyn (Midwood), is a definite favorite and worth checking out. So was this place worth it? Too Expensive? You never say. I am in NYC a lot and would love to find a good place to regale my manhattan friends who are curious about Turkish food. I know there are lots of Kebob stands down on Houston Street..but does anybody have a cozy (friendly!) favorite in either Brooklyn or Manhattan that won’t send me in to debtor prison? Thanks for all of Istanbul Eats. You are all such a blessing! Definitely worth it. Not too expensive at all. The food was nicely made and the prices were wallet friendly. Just wish the young man who was in charge when we visited was a bit more “Turkish” in his hospitality. 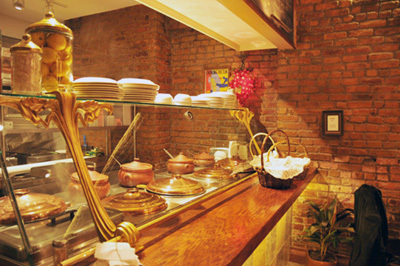 As far as Brooklyn goes, in a previous comment we recommended Taci’s Beyti, a homey spot in the Midwood neighborhood. There is absolutely no question: the best (only?) good Turkish food in New York is at the aforementioned Taci’s Beyti near Ave P\Ocean Ave in Brooklyn. But then, of course, a trip to Paterson, NJ makes for a whole different experience. Good point. Bereket is truly worth mentioning, although it’s also a much more downmarket kind of place than Bi Lokma. I don’t think Bereket serves up dishes like the olive-oil stewed artichoke hearts and celery root. Recently I had lunch at a Turkish restaurant in Vienna and I was very satisfied. I’ve recently relocated to the Chicago area, is there any good Turkish food around here? This is so similar to my experience at Bi Lokma. I had a nice meal but their credit card machine was not working that day and I did not have cash on me. The young woman behind the counter made me feel like a thief when I said I would have to return later with cash. A little politeness and hospitality could go a long way in endearing Bi Lokma. I work three blocks away and I have never wanted to come back because of that bad experience.